Most MacBook Pro owners use a cover/skin to protect their computer. 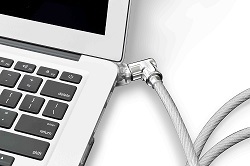 Mac Locks have created a simple but clever solution; it incorporates a neat cover that also protects your MacBook Pro via an integrated built-in security slot that can accommodate any of the standard cable locks sold on the market. That way you can lock the security cable to the case, and loop the cable's other end around a fixed object (like a table). Once the case and cable are locked together, thieves can't detach the case without damaging the MacBook Pro. This makes the MacBook Pro Lock flexible and light, not to mention stylish, so you can easily pack it in your bag and take it with you wherever you go. Protect your laptop and personal information while on the go with the Kensington Portable Combination Laptop Lock. Designed as a PowerPoint and Keynote remote.